As a teacher of ballet, it is always useful to have some ballet games for dance class that you can use on occasion to make your lessons more fun for the little ones, and also to give them a break from concentrating. In this post I will shorten to ballet games dance class. If you incorporate ballet games dance class, try to do games that teach the children something relevant to the dance class, withing the game. In that way the children are both having fun and learning at the same time. Here are a few ideas that you can use in your dance class to get your kids going. This is an old favorite ballet games dance class, and one that I use often. There are a few problems with this one if you have a child in the class who does not like to be the loser. First I set out enough chairs in a row back to back for all the children to sit on. I then play the music and tell the children what steps they have to do around the chairs. Sometimes we skip, sometimes we walk with pointy toes, sometimes we run on our tippy toes and other times we march. Now and then I also add in a pony gallop or two. On the first round I normally don’t remove a chair so all the children get a chair when I stop the music. I start removing chairs from the second round. Once a child is out, I ask her to remove the next chair and then she sits and stretches while she waits for the next one to be out. The children just love this one. It is also a very easy one for everyone to participate in. The aim of the game is for the children to freeze when the music stops. This teaches them to listen to the music. Once they get this right, you can give them instructions on what to do the next time the music stops. For instance they can balance on one leg, or touch the floor with with both hands. This teaches them to listen to instructions and remember what to do. I do this one at the end of a class. All you need to do is find a lively piece of music with a chorus and a few verses. You then give them a rhythm to clap that goes with the chorus and let them practice it a few times. Once they have it, you can start the music. Tell them what steps you want to see, and once the chorus comes on you shout stop and the children have to clap the rhythm that you gave them. This game is also great for musicality as well a reinforcing steps that they learnt during the class. Sometimes at the end of the class we have a concert. I divide the children into two groups and make the one group the audience, and the other has to dance on the stage for their friends. Give them a theme and play some appropriate music and you will be amazed at what they come up with. Most of the children love this game, but if you have a shy one, let her stand next to you and help you pick a winner from each group. 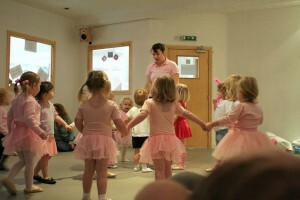 For this ballet game dance class you will need some hula hoops – four or five of them. Line them up in a snake type shape, with each hoop touching the next. Count the amount of jumps the children will need to get from one side to the other. The aim is for the child to jump from one side to the other without separating the feet. Put imaginary super glue on each child’s feet before they start. Once they have jumped over the last hula hoop they can run around on their tippy toes and stand at the end of the line. Once they have mastered the jumps with their feet together, you can add in pointed feet. Then you can make a hop scotch game out of it by making them separate their feet in a certain hoop. Feel free to leave any other ideas on ballet games dance class and comments you may have below dance teachers.